RabbitMQ is an open-source enterprise messaging system based on the Advanced Messaging Queuing Protocol (AMQP) standard. Applications Manager provides deep visibility into the performance of RabbitMQ system which enables you to ensure business-critical cloud services perform as expected. With Applications Manager, you can monitor the critical components of VMware vFabric RabbitMQ instances such as queues, messages, connections, channels and exchanges. It delivers comprehensive fault management and proactive alarm notifications that enables you to check for impending problems. For example, a large number of messages queued up in the RabbitMQ server could indicate that the consumer is unable to process the messages at the same rate as the producer. It is also possible that while the producer is publishing messages one of the consumers might have gone down. Applications Manager enables you to quickly identify and resolve these sort of problems before a huge number of messages could crash the RabbitMQ server. When combined with the support for monitoring VMware vFabric tc Server, the RabbitMQ monitoring feature in Applications Manager helps offer deeper insight into the performance of Spring-powered applications. Ensure your business-critical messaging system is running smoothly. Track data rates per connection. In case of network congestion, drill down to connections that are choking the bandwidth. 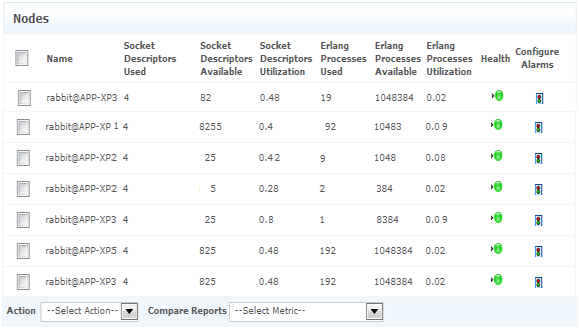 Get notified if the socket descriptor utilization goes above the specified threshold to ensure connections do not get timed out. 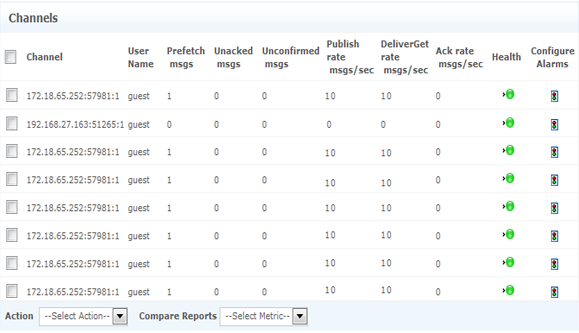 Monitor the number of messages published, delivered, routed and acked on a per channel basis. Understand which channels are publishing messages fast or consuming slowly. 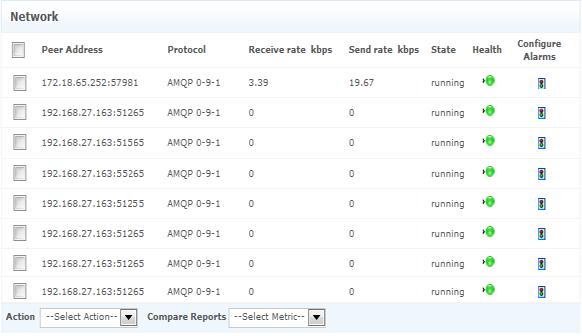 Monitor incoming and outgoing message publishing rates to ensure messages are broadcast to the relevant queues. 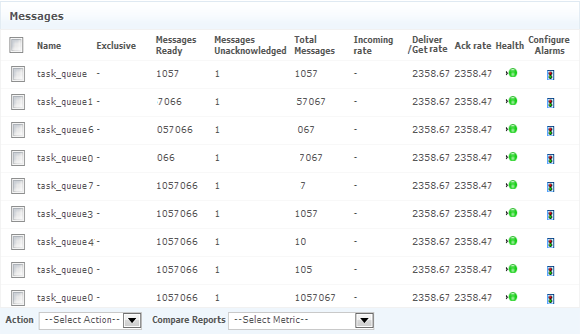 Track the total number of messages ready, messages unacknowledged, messages unacked per queue, queue length, etc. Make sure the queue grows sufficiently as the usage increases. Ensure your RabbitMQ system is sending and receiving messages without any problems. 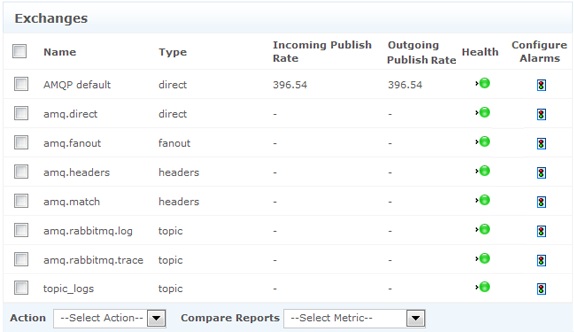 Determine which channels are publishing messages fast or consuming them slowly. Keep track of the number of messages pending delivery and the total number of queues. Identify which connections and hosts are the busiest. 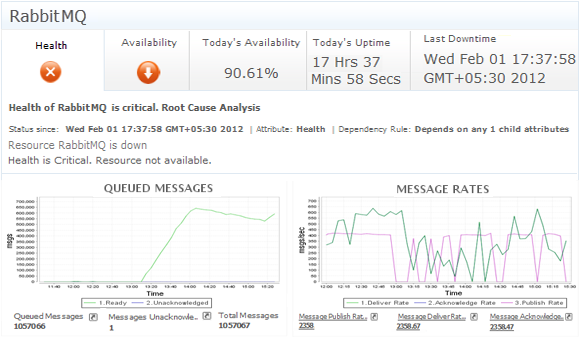 Troubleshoot performance issues quickly before the messaging system gets affected.